Our technicians are trained to identify undercarriage problems and predict the life of your undercarriage before major repairs are needed. Undercarriage evaluations are included in preventative maintenance service at no charge. Tracks can detrack if they are too loose or tear if they are too tight. 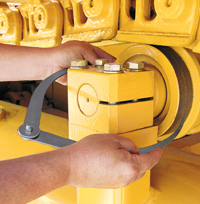 To correctly adjust the track tension, refer to your operator’s manual for tensioning procedures. The wider the shoe, the more problems you may have with turning your machine. Use the narrowest shoe possible unless a wider shoe is necessary to avoid sinking in very wet conditions. Mud and dirt can accumulate around the undercarriage, interfering with operation by changing the pitch, which leads to faster component wear. Knock away any debris every day after use and wash the tracks thoroughly with water. Higher speeds and traveling in reverse accelerate undercarriage wear. The slower the speed, the less wear on the undercarriage. Continuously turning to the same side can cause asymmetrical wear. It also increases wear on sprocket teeth, track tread, guide lugs and roller flanges. Visually inspect components for signs of wear, which may include cracks, bends and breaks. Make sure nuts and bolts aren’t loose, and look for wear on bushings, sprockets and rollers. Shiny components can indicate an alignment problem. Unnecessary spinning of the tracks can accelerate wear and cause cuts in the tracks. Reduce track spinning by using loader hydraulics to penetrate the material better.